It seems that a lot of GPU problems revolve around specific versions of drivers. Though AMD has their own support structure, you can often learn from information reported by others who fold. The hardware usage meter on the card also stays maxed out. 1) Please post the FAH log in accordance with the link below. 2) I notice that you're running 8 CPUs but they're paused, too. That's strange. 3) If that's Windows, please sort Task Manager's output by CPU utilization and post the list of top processes. 4) I notice you have FAH's performance slider set to the minimum. That's strange, too. 19:37:06:WU02:FS00:0xa4:- Ensuring status. Please wait. 19:37:15:WU02:FS00:0xa4:- Working with standard loops on this execution. 19:37:15:WU02:FS00:0xa4:- Previous termination of core was improper. 19:48:16:WU02:FS00:0xa4:Assembly optimizations on if available. 19:50:04:WU01:FS00:0xa7:Exiting, please wait. . .
Oddly, when I moved the performance slider to medium, I was able to pause the GPU task, and it also worked when I moved it back to light. Whatever was causing the GPU problem seems to have resolved itself. As for the CPU, based on the log, it seems my CPU can only get jobs when the FAH slider is set to light (8 threads) or full (16 threads). When set to medium (14 threads), the client cannot find any jobs. Whats strange about a status of paused waiting for idle? They are clearly set to run on idle and it isn't idle. Folding is set to light, so half the CPUs are idle, and the GPU never runs. 14 threads is a multiple of a 'large' prime (7) so will not work well. 15 or 12 threads would be better. The software chose 12. Mind you, all of this is CPU folding not GPU folding, which is what you asked about. I tried to remain childlike, all I achieved was childish. @JimboPalmer That makes sense for the CPU. Thanks. Getting back to the GPU problem - after it had gone away for some reason, it has reoccured. When the client shows that the GPU job is paused. GPU software and hardware LEDs both indicate that the load is at 100%, and it does not change until late in the Windows shutdown process. Interestingly, the GPU fan did spin down, so I wonder if the problem is actually the GPU reporting incorrect usage after this type of compute task is stopped/paused. * GPUs cannot be moderated. They're either folding at 100% (less whatever is used by other tasks) or they're not folding at all. * A CPU that runs K threads can be modulated in steps from 1 to K, excluding whatever prime factors GROMACS has trouble with. * Each GPU runs best if there's a free CPU available to manage data transfers to/from RAM and VRAM. The power slider is a simplified method of adjustment and is intended primarily for simple systems ere it works when the choices are relatively simple. including managing each slot's idle setting, if you still plan on using it. The reason I questioned CPUs running on "idle" is that the OS can manage CPU resources quite well. FAH sets its CPU processing priority to the lowest possible setting so it never interferes with foreground activities. Assign as many CPU threads as you choose and the OS will back off FAH processing to whatever resources remain. Unfortunately, that's not possible for GPUs. There's no such thing as GPu priority -- except for the OS's concept of "idle." Thus for people with slow GPUs (certainly excluding those with a Vega) may experience screen lag when they try to use their system because the GPU is busy when they want a simple screen update. bruce wrote: Thus for people with slow GPUs (certainly excluding those with a Vega) may experience screen lag when they try to use their system because the GPU is busy when they want a simple screen update. During those crashes it seems as though the card has gotten into some sort of an infinite loop scenario and the gpu tach still shows 100% even though the process stopped requesting compute from the GPU. I would assume that the drivers are reporting incorrect usage however the current draw at the wall is still high which suggests otherwise. Often times the fans spool down or never spool up, which then results in a huge purge of heat upon reboot. So this looks like a Vega problem, not a FAH one. The RX Vega drivers are still in beta, and are not WHQL (Windows Hardware Quality Labs) certified (see the direct URL to the installer), which is why we can't generate validated results with benchmarking tools yet. Yeah there is something strange happening. I have so far seen it happen with folding. Folding stopped hours ago, but card is still working hard. 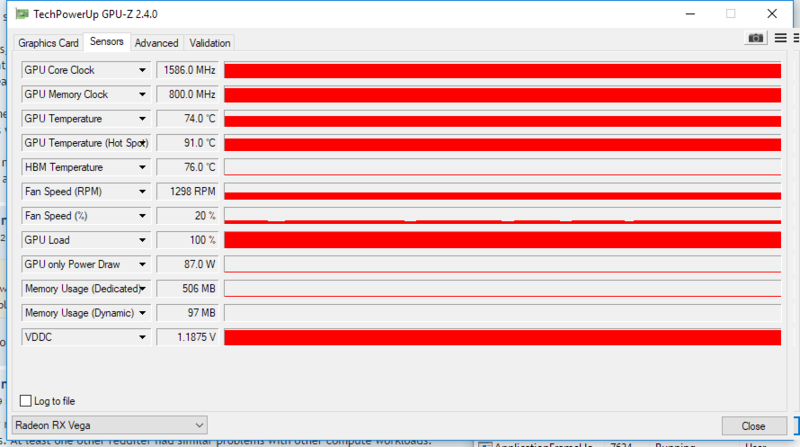 Not at full because fan speed dropped, but gpu usage is high and it's dumbing hot air alot. Have you reported this problem to AMD? bruce wrote: Have you reported this problem to AMD? I have not, I'm trying to see if it happens on anything else than folding, so far FAH has been only with this behavior. In any case report it to them. They do test prerelease drivers with FAH so if they need to fix the drivers so ithe GPU doesn't show an incorrect 100% or if FAH is somehow leaving the GPU in a loop, they'll fix it or tell FAH what to fix. I have now report this to AMD. Stll haven't hit this same issue on anything else than with folding.